You mention in your book STEM CELL REVOLUTION, that adult stem cell activators are considered a ‘disruptive’ technology / therapy. What does ‘disruptive’ mean in this case? When ‘disruptive’ technology or therapy is mentioned regarding healing, recovery and rejuvenation of the body, that is a positive thing. Disruptive means a better way and more options for the patient. 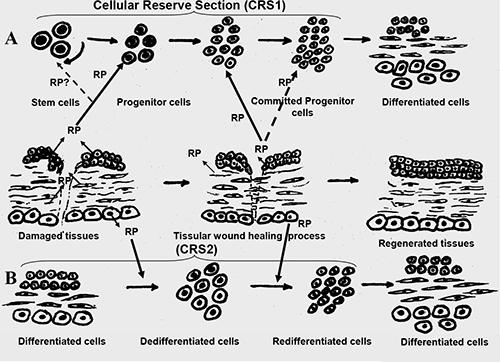 In Regenerative Medicine the ‘norm’ for addressing the musculoskeletal system i.e. injuries, joint problems, inflammation, ligaments, tendons, sprains, strains, muscles, etc., is from a conventional medical approach, also referred to as conventional medicine. Let’s use a painful knee for example. The ‘norm’ for treating this condition is prescribed anti-inflammatory medication, pain medication, X-rays, MRI’s, physical therapy, maybe some ice and heat therapy, etc. And then see how the patient does in a few weeks/months. Then after months of following these conventional approaches, the condition gets more painful, more debilitating and finally, the patient is given their death sentence:their knee is bone on bone! And the only option is knee replacement surgery, a semi-leg amputation procedure, above and below the knee and an inserted artificial joint. But with adult stem cell activators (stem cell therapy also) being a ‘disruptive’ technology/therapy, the patient now has more and better options to choose from than what conventional medicine has to offer. The patient/person can now opt, to try these natural targeted adult stem cell activators or ‘disruptive’ therapy/technology instead of being limited to health damaging pain medications or surgery as their final options. How long should I take the adult stem cell activators? We recommend taking them for 3 months minimum. It is not necessary to take them that long. But three months provides a strong blood serum base for better maximizing the healing and repairing process. When taking into consideration how long one has had a nagging condition or repeated occurrence or chronic condition, their response to the adult stem cell activation would dictate how long. Do I have to take them for the rest of my life? I will answer that with a question, first: do you have to take your blood pressure or cholesterol medication or stomach medication, etc., for the rest of your life? I guarantee you if you are taking any or all those meds you are no better or healed. The key is to consider your symptoms. If your symptoms dissipate, are eliminated or improved, etc., let that be the guide for how long you should take them. Your symptoms prompted you to decide to try the adult stem cell activators, so let the positive changes determine how long you should take them……….it is an individual decision. Are there any negative side effects from adult stem cell activators? No! The adult stem cell activators are plant-based derived. The energy and frequency from nature plus being super charged with nanotechnology at Ultra Low Dosages (ULD) prohibits any form of allergenic responses. The reduction in molecular (nanoparticle(s) size yet super charged with nanotechnology allows the individual to receive full healing, cellular repair and rejuvenation to the specific organ or bodily system without complication or interference with medications and or supplements. Has there been any studies or clinical research on these adult stem cell activators? Yes! There has been plenty of research and clinicals which go back as far as 15 years. Because of proprietary privacy and more so protection the studies are not publicized yet. Soon, upon permission, portions of the studies will be posted here on Bodyredesigning.com for all to review. What can one expect when taking the adult stem cell activators? Well, as in all cases, everyone is different, therefore results will vary. Much is dependent upon the individual’s age, current health condition, severity of condition, immune system, medical history, etc. Many people have reported improvements to their specific conditions in just days to weeks to months. Some of the results reported have been near miraculous! Another indication of the efficacy of the adult stem cell activators is the repeat orders. What conditions can these adult stem cell activators help? Most all degenerative illnesses and musculoskeletal conditions from; Kidney Disease, Diabetes, COPD, joint problems, nerve pain and damage, eyes and optical nerves, and much more. Can the adult stem cell activators help someone who needs to lose weight? Yes! Our studies have shown some participants who made no lifestyle changes i.e. diet and exercise lost weight within the first 30 days. For more information on weight and adult stem cell activators read about OPTI-WEIGHT in Stem Cell Revolution. What kind of results have people had by taking the adult stem cell activators? In Dr. Joe’s book STEM CELL REVOLUTION, he lists many testimonials from people with positive results. Here’s a couple examples - We have people reporting that after taking the adult stem cell activators, they came off dialysis, some being on a liver transplant list were removed from the list because of improvement with their liver. Some people with chronic joint pain had very good relief to being pain-free within a few weeks. People with neuropathy or nerve damage have report nearly 90% relief from nerve pain within 2 months. The list goes on and on. Are the adult stem cell activators expensive? No! They are very affordable. When considering all the costs of doctor’s visits, co-pays, out of pocket expenses when trying to treat chronic pain, or degenerative illnesses, etc., there is no comparison to the cost of these adult stem cell activators. How does one take the adult stem cell activators? Orally. We have a 20-20-20 rule. Take the activators on an empty stomach 20 minutes before eating or drinking. Place drops in 2 oz. of water and then keep the water (with the activators) in your mouth for 20 seconds, then swallow. Can I take more than one adult stem cell activators? Yes! You can take up to 4 different adult stem cell activators but not at the same time. Follow the 20-20-20 rule above.